Story A Day Challenge – Day 19 – Pop Culture Crush? I read today’s prompt and the first thing to pop in my head was: Nope. Write a story about your favorite pop culture icon or your favorite time period. I want to clarify that in the description and paragraph length tips it was made clear this is a fan fiction kind of thing. My problem? I despise fan fiction. I know what you’re thinking, I should write a parody. Nope, there are too many already out there. I don’t have a pop culture crush. Sure I love watching Doctor Who, Star Wars, Star Trek, comic book movies, etc but there is no character I’m so obsessed with I would want to write them into a story. I don’t even get celebrity crushes. I have several favorite authors but if I were to ask them for writing advice I suspect their first rule would be to never write fan fiction. I also don’t have a favorite time period, but if I absolutely had to nail it down I would say middle ages-ish because I love fantasy and most of what I read has dragons, kings and queens, epic battles with swords and spears and pole-arms, etc. So I’m going to stick with the time period thing. I think this story reflects my mood today. Enjoy! “Retired? Then you have plenty of time! Come one, it won’t even take long.” Miles begged. “See, you remember what it’s like to be young! You were the greatest there ever was. Help a fellow out. 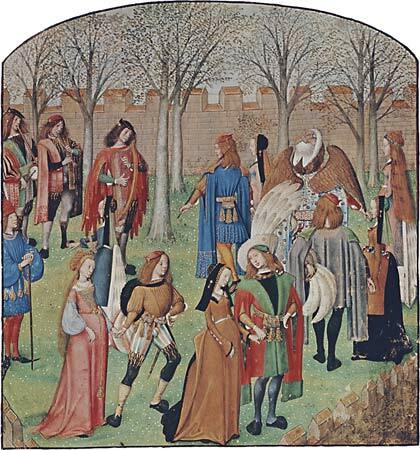 You’d be helping me with the ladies.” The man pointed to the bevy of females standing at the edge of the field. They were giggling and fanning themselves vigorously. “That’s not fair! These ladies are of my class,” Miles whined. “Ah! I see now, you’re afraid. Never mind then, I don’t need to fight with a coward. The man turned around started walking away. Cennor the dragon snorted in amusement, inadvertently releasing a plume of fire through one nostril. He stared down at the charred knight, his would be slayer, in surprise. Oh well, I did always like them crispy he thought. The ladies screamed as he ate the unexpected snack. At least they stopped giggling. He was too old for that shite. Maybe if I imagine Cennor is Brandon Sanderson in disguise this would fit the prompt better. Today’s prompt was to take a generic premise for a story what comes from a classic novel. I took a few elements from the novel but decided to go with a completely different story and put my own spin on it. This was really fun to write. Enjoy! I woke up early, filled with dread. When I was shown to my chamber last night Cathy extracted my promise to join her family this morning. Unwisely I agreed but now all I wanted was to pack my things and leave. Leaving the warm comfort of the bed I rose and tiptoed to the window. Damn, more snow had fallen in the night. There would be no sneaking out. I dressed nice for the meeting, as I felt it would be expected of me, and headed downstairs. I thought to be the first to arrive but they were ready for me. The father, Heath stood by the massive fireplace. Cathy showed me to a chair before seating herself and the brother, whose name I never caught sat a few feet away with a grin on his face. The maid brought two items and placed them in front of me. While her back was to the family she gave me such a look of horror I almost gasped. What was going on here? Before I could ask she gave a tiny shake of her head and hurried away. I turned my attention to the boxes in front of me. I could feel everyone’s eyes on me. Clearly I was supposed to choose between the two. What should have been an easy decision turned into something else. Something much more difficult. I glanced up and accidentally made eye contact with Heath. There was a strange, dangerous glint in those eyes that unnerved me. I could see he wanted me to choose wrong. What would happen if I did? But which was the wrong one? For all I knew, this could be the most important decision of my life. From the look in Heath’s eyes it could almost be a life or death choice. I gazed at the boy but only saw his perpetual smirk. I was afraid to look at Cathy but I did anyway. She smiled reassuringly and shifted her eyes to the left. What it a hint? Could I trust her? Why did they all care so much what I chose? Why the hell was no one speaking? The tension in the room was escalating dramatically and I felt ridiculous. Finally I grabbed the box on the left, Corn Flakes, and poured them in my bowl. I peeked at Cathy who was visibly relieved. The brother, clearly amused, took the box when I passed it to him. Heath looked annoyed as he finally came to the table to sit down. No one spoke as we ate. I couldn’t help but wonder what would have happened if I had chosen the Frosted Flakes. A stranger to a remote area encounters a family with a mysterious and troubling past. Instead of messing with the family’s weird past I decided to pick a moment in time, which I think is a good showcase of their own special crazy. I also used the names (or a variation) from the source novel. The inspiration for this one was an old joke that you’re supposed to drag out for 10 minutes. I only vaguely remember the joke but I remember how annoyed I was in the end when the punchline finally came and how amused the guy who told me was at my reaction. I hope you all aren’t annoyed with the ending lol. I watch her every morning as she walks to the coffee shop, careful not to let her see me. I think she might be the one. I hide in the alley until she comes out then walk towards her. Occasionally we make eye contact and she smiles before quickly looking away, but she doesn’t see me today. I don’t understand it. Why doesn’t she notice me every time? Do I make her uncomfortable? I only want to make her happy. Maybe today will be the day I show her I’m perfect for her. I normally go to the park at the end of the street after our daily encounter but today I turn around and follow her. She walks several blocks before stopping at a store. She’s staring into the window smiling. Curious, I edge closer to see what’s made her so happy. When I see what it is I growl low in my throat startling her. She backs away, telling me I’m a good dog. I let her go. Clearly she’s not the one for me if she’s smiling at kittens. Damn cat people! “Hey boy, are you lost?” I hear from behind me. I turn and see the most beautiful, kindest eyes. I feel my tail moving of its own accord. He sits on his knees and pets my head. Maybe he’s the one. Hopefully he doesn’t like cats. Today’s prompt is about the inner self of your character trying to break out, to be seen, to be heard, to simply be acknowledged. Think along the lines of being present in a group, yet you’re being discussed as if you were not there. Now multiply those feelings by 100 for your character who, for reasons you will develop, cannot (at the moment) speak up for themselves. Why is your character ‘invisible’? You may want to go down the path of personal knowledge, for instance someone with a severe disability which restricts their line of communication. Yet they are ‘in there’ and fully aware of what is going on around them. How do they feel? What can they do to get attention, and help? Perhaps you want to go the fantasy route and your character has had a spell put on them. What or who will break it? How does the ‘invisible’ one deal with the situation they are in and what do they do to help themselves? Your story should conclude with your character achieving ‘visibility’. Not too many tips this week – let your imagination, and your emotions run free with this one. Whoa! She said: Not. Too. Many. Tips. I don’t normally post the prompt and the tips but in this case I felt I had to. In all fairness her last prompt had a whopping nine tips so I can see where she thinks this one doesn’t have many. I apologize in advance to the person who made this prompt but WTF woman? My first thought after reading the prompt and tips was ‘is there anything else you’d like to tie me down with?’ So my rebellious/stubborn streak kicked in and I wrote what I wanted. My character is noticed by the woman but not in the way he wants. That is as close to the prompt as I got. I don’t know about the rest of the writers out there who take these kinds of challenges or use prompts but for me, if someone tells me I should do it a certain way or offers story ideas, you can bet I will NOT go that way. I truly don’t think I’m being rebellious. I simply don’t want to write someone else’s story. Also, I don’t normally write in present tense so there are many flaws here but I’m glad I challenged myself. Today’s prompt almost threw me off. I read it before I even sat up this morning. I thought about it during breakfast and while I waited for my daughter to get ready for school. After dropping her off it was quiet in the car so I pondered some more. I came up with a bunch of ideas but I didn’t like any of them. Then when I pulled into my driveway a new idea popped in my head. I couldn’t get in the house quick enough! I hope Dominica likes me he thought for the hundredth time. Tom’s nerves were getting to him now that it was almost time to meet. He hoped they would find some common ground since they couldn’t be any more different. He was from the farm and liked to race and get muddy. From everything he’d been told she was a city girl with refined tastes and good manners. She would probably enjoy well manicured lawns and high tea, but he could spend an hour happily splashing around in the river and eating whatever he felt like. It wasn’t like he stayed filthy all the time. He enjoyed getting dirty but he liked getting cleaned up just as much. He wondered if she ever got dirty. Pre-judging her wasn’t alleviating the tension and was stupid so he stopped. Tom did decide she would be completely out of his league. Billy, the man who set them up, told him repeatedly how beautiful she was and how happy Tom would be. If Dominica didn’t like him he would be crushed. I don’t know why I’m so worried, they always like me. He knew he was the height of masculine beauty; everyone commented on it. Maybe that was the reason he was so worried. Billy made it sound like she was more attractive than Tom, which had never happened. He heard a vehicle pull up and ran to the edge of the corral to get his first glimpse of today’s date. He watched as Billy and another man opened the gate of a trailer and Dominica backed out. She turned and made eye contact with him, almost stopping his heart. She was as beautiful as they said, more gorgeous than him. She pranced over to him and all his doubts vanished. They would make beautiful babies together. He was so glad they sent her over from the Equestrian Center. Tom Thumb the racehorse was in for a great day. Write a short story about two people meeting up for the first time. They may have emailed, texted, tweeted or whatever, but this is the first time they’ve met face to face. I couldn’t stand the idea of writing something super literal for the prompt. I don’t know if it’s my rebellious nature or simple stubbornness but it keeps life and writing interesting. When I edit I plan to get it down to 300 words but I’m staying out of that mode until the end of the month. Today I almost broke free. As she read I became more and more real. I could feel myself lifting from the pages and spread my wings wide in preparation. Then her doorbell rang and I was only fiction. Maybe she’ll pick up the book later and I’ll get another chance. Write a story from the perspective of someone in a piece of art. Feel free to choose your favorite painting, but you can also use sculpture, photography, or even performance art. Sorry for the bad photo but I took the picture from below it. I loved the way this looked when I read it so much I tore out the pages, glued them to a piece of poster board and hung it above my bedroom door (well my husband did all the work). 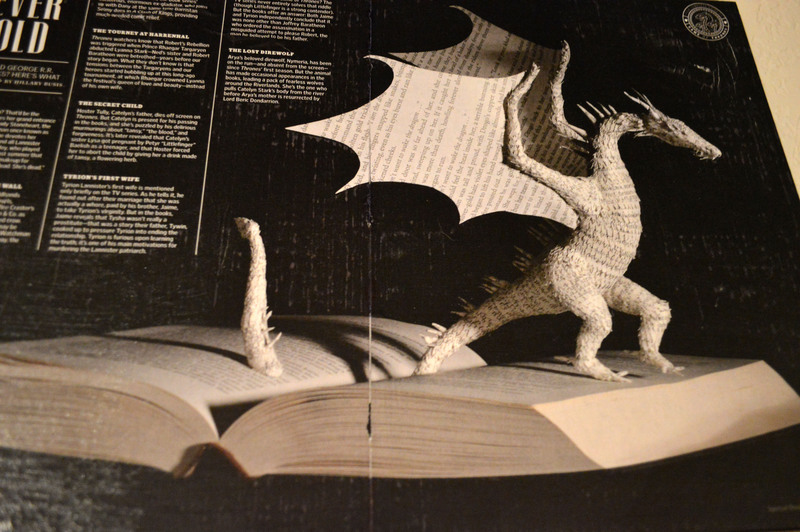 I loved the way the pages already looked worn and how the dragon seemed almost free of the pages. Isn’t this the way a good book should be? “Hey Kelsey, since you’re not doing anything, want to watch some TV?” Dave asked. “Not busy? I said I was reading.” Kelsey scowled. Why does he always do this? She firmly locked the door behind him. I’m glad I never gave him a key she decided and went back to reading. Write about an odd couple. No, your characters don’t have to be an actual romantic couple. They can be siblings, classmates, friends, enemies, or anything in-between. But you do need to have a couple (two people), and they do need to be at odds. Their personalities and their motivations should be dramatically divergent. Try to exaggerate their differences and see what action transpires. I figured today was a good day for 100 words. I usually find super short stories hard to do but not this time. I’m lucky because my husband doesn’t think reading is a waste of time or ‘doing nothing’ but I’ve had a similar conversation with many other people throughout the years. The worst was a guy at work that could not understand why I would rather read my ‘dumb’ books than listen to his relationship woes and conquests. If you’re a reader you’ve probably had to deal with something similar. I couldn’t come up with a title (no surprise there) so I used the prompt as the title. I really need to come up with ones that don’t contain the word the. Nick stood before his art collection discontented. He’d known for a while something was missing but wasn’t sure what he needed. Before today he felt he had a little of everything. At least one piece of art representative of every style he loved. Some he adored so much he would have tattooed them on his own body but he could not tolerate pain. So instead he gathered the artwork of what he truly wanted but couldn’t tolerate and displayed each along his walls. He realized he needed a masterpiece for a focal point but nothing he had would do. Maybe he could hire someone to draw something special for him after breakfast. It would cost a fortune, probably as much as an actual tattoo, but it would be worth it. Decision made he went to eat. Sitting in the restaurant enjoying his omelet he noticed someone a few tables over. A guy with no hair sat facing the other way. On his head was the most glorious tattoo Nick had seen yet. He could see the back and tail of a dragon in red, royal blue and purple tones. When the man turned Nick could see the dragon’s head and upper body started on his forehead and swept back, ending at the base of his neck. Excitement filled Nick. He checked his bag as discreetly as he could to make sure he had what he needed. He finished his meal quickly and paid the waitress but asked for one more cup of coffee while he waited for the other man to be done as well then followed him outside. Luck was with him as the guy had parked close to Nick’s own vehicle in the back lot. Approaching as quietly as he could, he closed the distance and jabbed the guy with his syringe. The man dropped to the ground and Nick dragged him to his van. He used duct tape to secure his victim and used another injection to make sure there would be no surprises. Nick made the short drive back to his home and once inside tied the man to his work table. He again admired the magnificent tattoo. He recognized his favorite artist’s work of course. Most of his collection were by Rodrick at Tattoo-ing’s Palace. He took several pictures of the man’s head before opening his toolbox. He hoped the bone saw would do the job. Nick had many arms and legs in his collection but he’d never cut off a head before. Skinning the man was out of the question. The scalp was too thin and he couldn’t risk damaging the art. This was so much better than a paper drawing! He couldn’t wait to make it the main attraction; finally his collection would be complete. I waited most of the day for a prompt for the Story A Day Challenge to be posted but it’s not there yet. I didn’t want to use the prompt being late as an excuse to not write so I decided to just write whatever came to me. I’ve had a lot of ideas for creepy stuff lately so I went with one of those. I had planned to use this particular idea for a longer short story but quite frankly it freaked me out too much to do more with it. This guy is clearly nuts but he is correct in believing that some tattoos are works of art. Sidenote: Whenever the Story A Day prompt is posted I will try to write another story using it and post it next week. Today’s prompt didn’t completely work for me. It involved the premise from a well-known (not by me) novel. I had a few ideas but I felt they were too obvious and I think we all know by now that’s not something I find acceptable. What I decided to do with it was use a character from a story I’ve been working on (on and off). It fits the prompt a bit. Drae noticed the flower on accident. Though it was brightly colored, her eyes were focused straight ahead. Just get through the field and everything will be okay she told herself. It took almost tripping over her own feet for her to look at the ground. She brushed her dark hair out of her eyes and noticed before her a bright yellow misshapen flower. The petals were barely hanging on and the entire plant drooped, but it was alive. The horror in front of Drae lost her interest as she stared at the flower. How strange to find something living in this field of death and decay. It was one ugly, normally unwanted weed but somehow it gave her hope. Drae turned her attention back to the task that brought her to the field. When she squinted she could almost see the building the survivors called HQ. All she had to do was get inside. First she had to cross the damned field. Arrayed before her were more than a hundred ghosts. Each glared at her with hatred, but none came too close. She knew they sensed she’d already been possessed and she was anathema to them. For added insurance she’d slathered a paste consisting mostly of iron powder and salt over her entire body. Even getting within a few feet of her would burn the shades. She didn’t know how they could stay in the area when the ground had clearly been sown with salt, but she supposed the presence of so many of the living was enough of a draw to overcome the discomfort they must have felt. Drae hoped they weren’t so accustomed to the pain that her protections would still keep the spirits at bay. Glancing down at her feet she thought about the flower and how it came to attention. Keeping her gaze straight ahead could be a bad idea so she looked at the ground and started walking. When she made it through this hell she would tell the leaders she was taking over. Once they knew who she was there would be much debate and dissent. After all, the blame for the deaths of two-thirds of the human population rested on her shoulders. She was the one who started the Ghost War. A person just starting out in their field takes a prestigious, entry-level position in a big city, but the result is not as perfect or exciting as they imagined. Okay so it only barely goes with the prompt. Since Drae is about to take over the resistance, it could be argued this is her first day on the job. The job will be much harder than she can possibly imagine and she will have to do things she never dreamed she would be capable of. She won’t have the option of making good choices. She’ll have to choose from the best of bad options. I think this will be the story I work on for Nanowrimo since it has my attention so fully at the moment. Jacob stared into the tunnel. The opening was brightly lit but a few feet in there was total blackness. He mentioned this to his companion, carefully sounding casual. “It only looks dark because the front is lit up. Don’t be such a chicken,” Susie mocked. “I’m not a chicken!” His ego stung, Jacob looked away so his new girlfriend wouldn’t see how scared he was of the dark. “I know you’re not, I’m sorry. Come on, let’s just go for it. You said you wanted to.” Susie said, using her power pout and twirling her red hair dangerously. “I do, but it’s really dark in there. How do you know we’ll be able to find out way?” Her lips were almost convincing him. Jacob heard the disappointment in her voice. Time to man up. “No, let’s do this.” He grabbed her hand and they got into the cart that would take them through the tunnel. When they passed the outside lighting he was pleasantly surprised to see there were more lights inside. These were more subtle, romantic even. He put his arm around Susie and moved closer. His nerves were on fire but he was determined. As he leaned in to kiss her, his first kiss ever, the electricity went out in the Tunnel of Love, plunging them in darkness and bringing the cart to a standstill. For one moment the fear came back, but the girl’s breath on his face dispelled the panic. When she kissed him he decided maybe he wasn’t so afraid of the dark anymore. Today’s prompt has your main character about to enter a tunnel. My first ideas about this prompt were all creepy. There were tips included with the prompt and most pointed in that direction. I decided I wanted to go a less obvious route. I’m so happy I’m not as young as these characters anymore!